· You can use the cabinet which has lots of racks and a kind of door which can be pulled. This kind of cabinet is very good for the small size kitchen since it has some cabinet doors which can be closed while they are not being used. The closed cabinet can give you more space and also can prevent the food material from the dirt and dust. · If your cabinet in the kitchen is made by wooden material, you can make a kind of modification on the cabinet’s door by adding a kind of mirror on it. The reflection of the mirror can give illusion of wider space of the room. · You also can use a kind of kitchen cabinet which can reach the plafond. Since it has so many spaces inside the cabinet, you can put so many things inside. 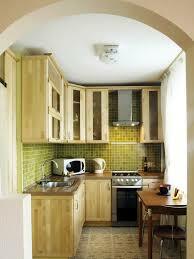 You can put the kitchen appliances which are frequently used in the low part of the kitchen cabinet. Meanwhile, the upper part can be the storage of some kitchen appliances which are quite rarely used, such as plate collections. · Good lightning can be a good way in making the wide space illusion of a room. You can direct the lamp’s lightning to the kitchen table. You also can give bright colors as the wall paint or the cabinet’s color. You also can give a big size of window so that you can enjoy the wide view while you are cooking. This big size window is also can give the good lightning effect for the kitchen.